To view 4 more pictures, interactive maps and the full, detailed description of the Legacy at Washington Arms (55+) community, please Login. A new construction condo in Legacy at Washington Arms offers secure, carefree living. These properties give owners age 55 and better the opportunity to experience the best of their lives without hassles of home maintenance. 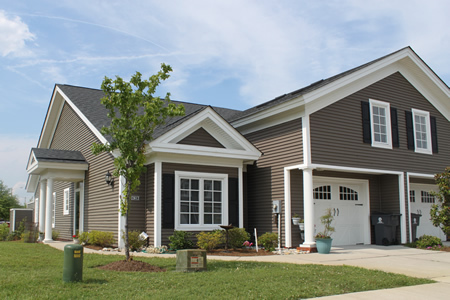 Located in Chesapeake, VA, this community allows veterans easy accessibility to military bases such as NAS Oceana, Naval Medical Center Portsmouth and Naval Station Norfolk. This area is a prime place for teachers and tutors too as Deep Creek schools are close by. When seeking properties in hopes of relocating, look at how each home can add years to your life. Walking into a unit in Legacy at Washington Arms is like breathing fresh air. These homes combine the low-maintenance lifestyle with modern features new construction is known for. Each condo here comes with entry storm door, private patio, security windows and more. These homes range in size from 1,800 to 2,000 square feet giving ample living space. In total, there are 25 units housed within six buildings so neighbors won't be strangers for long. Chesapeake is a place for the young and an even better place for the young at heart. Virginia golfers can perfect those swings at properties like the Bide-A-Wee Golf Course. This Curtis Strange signature course offers green fairways that wind through ponds, trees and lush grounds. Players can stop by the pro shop, use the two practice putting greens and get a bite to eat at the restaurant. Owning a new construction condo gives residents opportunities to stay active. The Deep Creek Community Center offers activities and classes for those wanting to learn something new, stay fit or meet new people. Legacy at Washington Arms is also close to churches, shops and entertainment. Living in one of these properties is a proactive step towards bettering your health. Get the benefits of new construction and the perks of a condo all rolled into one. With buying a home in Legacy at Washington Arms, owners get the dream package in Hampton Roads. Send me more information about the Legacy at Washington Arms (55+) new home community. Our agents gladly offer FREE property tours of Legacy at Washington Arms (55+), Chesapeake and homebuyer consultations to all serious buyers.